ShelterWorks Receives Commercialization Grant from Oregon BEST - ShelterWorks Ltd. The article announces that we were recently awarded a commercialization grant from Oregon Built Environment & Sustainable Technologies Center, known as Oregon BEST. We’ve been pursuing a grant for a couple years, as it will open doors that have been inhibiting our growth. We’ll use the money for testing to establish the structural properties of our Faswall® building blocks. The company recently landed its first big commercial project, a two-story business technology center in Bismarck, N.D. Van Denend is hoping the test results will persuade other contractors to follow suit. The testing will be carried out early next year at Portland State University’s Infrastructure Testing & Applied Research Lab, a research facility for Oregon BEST. Experiments will provide third-party data on the strength of a wall built with Faswall. 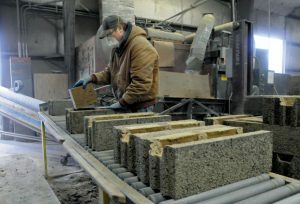 Based on preliminary testing, Van Denend believes his company’s wood-based product will prove substantially more shock-resistant than other insulated concrete forms, known as ICFs in the construction trade. Hall explains that about 90 percent of our building projects are residential, as we’ve had a difficult time making inroads into commercial construction. If the PSU lab validates our claims, however, it could open doors for commercial construction. Getting into the commercial market should actually double our sales within a few years. Read the full article for more details here. Look to Faswall® for future commercial projects! Categories: Faswall Engineering, ICF Commercial Buildings, News & Events Leave a comment ?